This entry was posted on February 5, 2013 at 10:10 am and is filed under martial arts for kids, Martial arts instruction. You can subscribe via RSS 2.0 feed to this post's comments. I think the most important thing to do is set clear (and high) expectations. We spend a good amount of time in the dojo working on simple body control, “Stand straight, no slouching, no fidgeting, no talking.” The students still do all of these things, of course, because they are just kids, but those are the expectations. Split up chatters, and stress that you come to class to learn how to focus, and excessive/inappropriate chatting breaks the whole class’s focus. Foster the concept that they are a class, that they all need to do their part so everyone can succeed. Generally, I am very positive and upbeat, but also quick to use a firm voice with students when needed (NOT yelling, but stern). They need to know that you genuinely care about them, but that you are not to be trifled with. It is kind of like lion taming…if you show weakness or fear, it’s all over. From day one the instructor(s) need to set and enforces the expectations, and everything else should fall into place. Never hesitate to involve the parents if you are having a problem resolving an issue. Pushups rarely get doled out in my classes (even then it is only a quick 10, and never to white belts). Discipline is just a part of our dojo environment, and the kids and parents acknowledge and respect that. I’m told I have a higher than average tolerance for talkers and jokesters in my classes – and maybe it’s true, because I was one myself as a kid. I won’t tolerate outright insolence, disruption, poking or hitting or any behavior that will get someone hurt, but the important thing, to me, is whether they’re good kids who are learning, trying, and doing the best they can. Sometimes “the best they can” doesn’t look too good. Over the years, I’ve seen many, many kids who, if you watched from the sidelines, looked like hopeless daydreamers or goof-offs. Their parents will hear me calling the child’s name to correct or get their attention over and over, and a couple times parents have even asked me whether they should pull their child from class, because it doesn’t seem like they’re getting anywhere. I’ve told them, no, I can see the promise in their child even if their progress right now isn’t very fast, and if they keep bringing them to class, and I keep urging them on in spite of their behavior or seeming lack of effort, one day we’ll reap the rewards. Some of these “hopeless goof-offs” have grown into outstanding young students and fine black belts. So, yes, I would say there are some kids who are simply immature, whose behavior won’t improve until they grow up a little, but it’s worth it to keep them coming until it clicks. John, I really liked your comment and agree that many students just need time to develope the maturity needed and expected. First, I found that when there is too much time standing still, the students attention wanders. If there is constant movement in the flow of the class, then the talkers don’t have time to talk. Second, when I stress etiquette and the importance of not talking, then there is no talking. The times when the disrupters can’t help themselves, I implement disciplinary action on the entire class and that seems to keep everything in check. Sometimes you have to focus on the students for a while and catch/correct them while they do it. Once they know what is expected, everyone picks up and follows along. Thanks for chiming in! Excellent points. 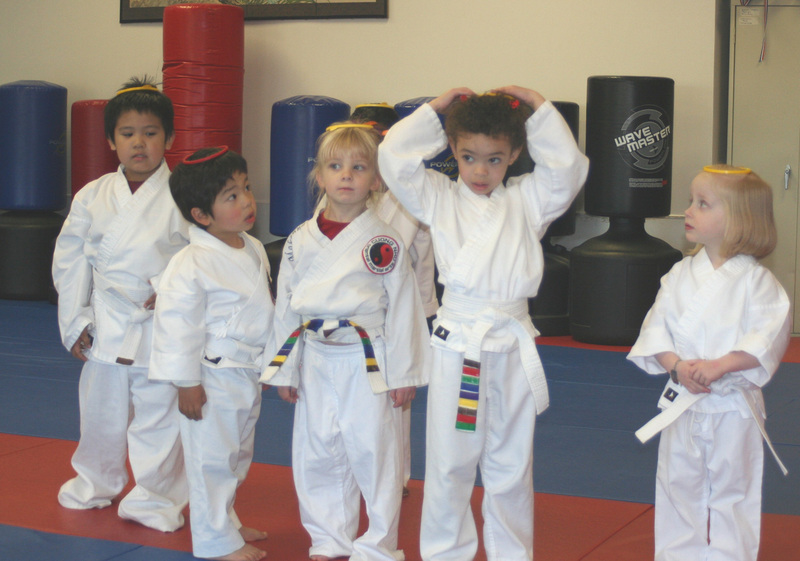 Keeping things moving is vital in a kids’ class (or any class for that matter). Obviously there is no perfect solution to this problem, having a “toolbox” full of options is our favorite approach. We like to start with encouragement, then we go to discipline (we do hand out pushups, but not too many…) After that we pull the child to the side to explain what we expect and what they are doing right and wrong. If we still don’t get a response we bring the parents into the picture. Having the parents check in with us after each class to get a thumbs up or explanation as to what the student did wrong is a real motivator. Sometimes we hold students back from testing until their behavior improves (this only works for advanced ranks) and other times we make them sit out a small part of the class (usually a game.) We have also been known to move the chatty kids away from their friends and to a lower rank part of the class. Once they show improvement within that class we will move them back up in line. If the student does not improve after all these steps then sometimes you just need to wait for them to mature. It may be a painful process, but that is why we are there. Set the best example you can, have fun, build up (don’t break down,) have fun, encourage, and most of all HAVE FUN! I’ve let this one percolate for a while, because I think that the question if more complex than it seems at first. I agree with many of the previous comments regarding the balance between expectations (no disruptive behavior, good control of one’s body and courteous attention), rewards-both verbal and tangible- and corrections/discipline steps. This balance often needs to be fine-tuned for individual students. As with the more-experienced instructors above, I have discipline methods ranging from a stern voice, to sitting them out of class to rank/promotion consequences. Note – Talking with parents IS a consequence. Use it with care. When correcting out loud, I always explain the behavior and the reason it’s a problem. or else I don’t correct out loud in front of the class. If I do it publicly, it MUST be a learning experience for everyone. I favor private correction otherwise, or for repeated behavior. I never assign pushups as punishment for anything except for the crime of not doing your pushups. First – Very few of the comments address the factors that we have direct control over, such as the speed that class moves, or the level of verbal verses physical interaction in class. Many children verbalize because that is part of their strongest learning tool set–some of us are verbal learners. They may not be talking to their classmates because they want to chat, but because that’s how they learn best. Second – You specified that this was not a student who didn’t like class, but might be less capable of showing the required behavior. I would add that some disruptive behavior is a kid’s way of slowing things down if they are struggling. This is consistent with the half-hearted stances, etc. I often spend time touching base with these students after class-never more than a minute or two-in order to clarify expectations. The trick is to emphasize that disruptive behavior and foot-dragging only make it harder for everyone, then underline your certainty that they WILL get it if they keep focused. I then let them know that I will correct their disruptive behavior and help them put that energy into their Karate. The keys, in my mind to keeping this student making progress on potentially disruptive behavior is to first identify what need the behavior meets then work with the student to meet that need, and to do this while NEVER changing the basic expectations. All trees grow, but not at the same rate, or under identical conditions. I’ve corrected my profile, but cannot go back and fix the name on this post! UPDATE: Never mind! There’s nothing there but a weak sales pitch for learning real samurai techniques from a series of online videos. Chris, I’m going to assume your blog is better than that!